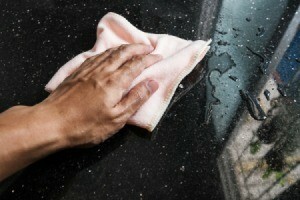 Marble polish is one possible solution for removing water spots on a marble surface. This is a guide about how to clean water spots on marble. Check out places like Lowe's or Home Depot and even your local Ace Hardware for 'marble polishing paste' or 'marble polishing kits'. I bought a new bathroom vanity with a marble countertop and it's getting water marks on it. Does anyone know how to clean it? We used to clean our living room marble tabletops with toothpaste. I think it was like a baking soda toothpaste. Been many years ago. I have white spots on my new marble vanity that look like it is deep in the marble. It looks like the marble has faded, but it also feels a little rough. It looks as if something was sitting on it and left a ring. Marble is also affected by acids, so if someone was cleaning with vinegar or CLR, that could have cause the damage. I don't think there would be a way to fix it, but perhaps the marble polish mentioned might help.